The factors behind the changes in the level of the Caspian Sea are still the focus of debate. Scientists have not ruled out the involvement of tectonic (movement of the Earth’s crust below the sea) or geomorphologic causes (rate of sedimentation). However, these would appear to have a minor impact in comparison to changing climatic factors, combined with the effects of human management of surface water in the Caspian basin. Most of the water flowing into the sea comes from coastal rivers. 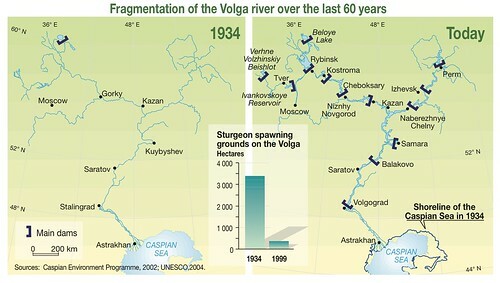 The quantity and quality of this water, particularly that of the Volga, are key variables in the balance of the Caspian. To this must be added rainfall over the sea itself. Water may also be lost through infiltration into the ground and flow into the Kara Bogaz Gol gulf, but these factors are insignificant compared with natural evaporation from the sea. The construction of a large number of dams and industrial facilities on the rivers feeding the Caspian Sea has caused a significant change in the quantity of water inflow. 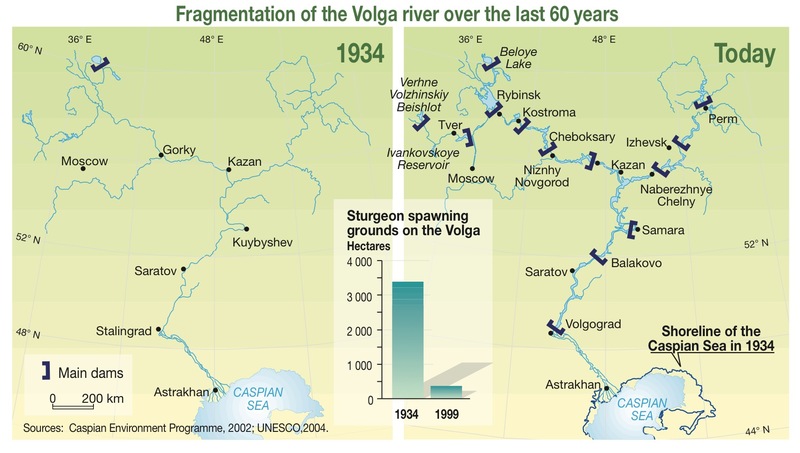 The creation of a succession of large reservoirs, especially on the lower and middle Volga, has led to significant losses in flow rate due to additional evaporation from the surface of the water. Coupled with unsustainable water consumption, in particular in connection with irrigation, the river flow rate is now only 10 per cent of the natural levels.